Scooper - Technology News: Japan has negative rates, so why is the yen getting stronger? Japan has negative rates, so why is the yen getting stronger? The yen reached a fresh 17-month high on Thursday of Y107.71 per US dollar after trading above Y112 last week. Its accelerating rally casts a shadow over the credibility of the Bank of Japan , whose extraordinarily easy monetary policy was designed to fire up the economy under the reforms promised by Shinzo Abe, prime minister. So why is the yen strengthening and what does this mean for Japan’s companies, financial markets and policymakers? Why should the yen be weaker? In late January the BoJ introduced negative rates, which should in theory have banks rushing to lend yen wherever they can while also scaring foreign investors out of Japan’s bond markets in search of better returns elsewhere. The yen initially weakened to almost Y122 against the dollar after NIRP was adopted. Subsequently, it has rebounded sharply. The strengthening through Y110 takes it to levels not seen since the BoJ first cranked up its monetary easing in October 2014. Japanese government bonds offer negative rates all the way along the yield curve out to 10-year JGBs, which offer minus 0.07 per cent. Ministry of Finance data suggest this has duly spurred demand for higher-yielding foreign bonds such as US Treasuries. One reason that this is not weakening the yen as it should could be hedging. “Everyone is talking about huge, huge outflows. But we think they’re increasingly being hedged and that’s limiting their effect,” says Mitul Kotecha, head of Asia currency and rates strategy at Barclays. How does this relate to the so-called currency wars? A weaker currency is seen as helping foster stronger growth and higher inflation expectations. That has led some to describe aggressive monetary policy easing in recent years as a currency war . Japan is a past combatant. A decade ago it was an aggressive intervener, selling yen to weaken the currency and help its exporters. But more action is unlikely this time. Earlier this week, Mr Abe sent the yen higher after he told the Wall Street Journal that countries should avoid seeking to weaken their currencies with “arbitrary intervention”. Meanwhile, the wars continue. The dollar’s recent weakness followed the Federal Reserve reducing its interest rate-rise expectations, lifting the yen and the euro in the process. What does this do for the BoJ? Not much, frankly. 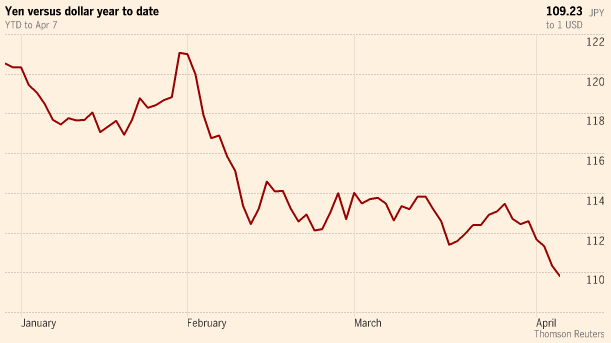 Yen strength is a real blow since it undermines the BoJ’s efforts to cut borrowing costs and kick-start the economy. It also calls into question the credibility of the central bank in the market’s eyes. The BoJ next meets in a fortnight. “It raises questions about [quantitative easing’s] efficacy if there is no forex transmission; for example, are negative rates worth pursuing without a weaker currency objective?’’ says Alan Ruskin, strategist at Deutsche Bank. Japan stands out as the worst-performing large developed equity market so far this year, barring Italy. The Topix is down 18 per cent, dropping 13 per cent since early February. Theory suggests that Japan’s exporter-heavy stock market tracks the yen, gaining as a weakening currency lifts yen-denominated earnings, and falling when the yen rallies. But could it in fact be market weakness that is helping lift the yen? Consensus analyst forecasts have the yen at Y115 against the dollar by midyear and Y118 by year-end, according to Bloomberg, down from estimates of Y123 and Y125, respectively, before the BoJ introduced NIRP in January. Stronger yen bets are at extreme levels, according to widely followed data from the US Commodities and Futures Trading Commission. This suggests that at least a short-term retrenchment for the yen is possible as profits are taken. Kit Juckes at Société Générale says that yen long positions exceeding 50,000 contracts happen only rarely. “These spikes in positioning do seem to me to point to a turn in the tide — which I think is coming,” he adds. But there is also an argument that the yen is far weaker than it appears to be, once adjusted for inflation and measured against a basket of its trade partners. By the BoJ’s own measure, the so-called real effective exchange rate is hovering not far from 40-year lows. Authors: Jennifer Hughes and Michael Mackenzie.